"We continue to expand our trails and related product offerings based on visitor interest and needs," said John Meroski, FACVB President and CEO. In 2007, the Fayetteville Area Convention & Visitors Bureau (FACVB) teamed with area historians to develop the community's Cultural Heritage Trails product. The resulting 11 themed driving trails launched on http://www.VisitFayettevilleNC.com late that same year. In October of 2012, the 17th trail launched. Last month, the bureau introduced the Cultural Heritage Trails guide to extend the trails information to more visitor segments. "We continue to expand our trails and related product offerings based on visitor interest and needs," said John Meroski, FACVB President and CEO. The print guide includes maps, detailed descriptions of the history covered in each trail, full individual site descriptions and site-to-site driving directions. Themes include "Patriots, Past & Present," "African American Heritage," "All-American Adventure," "Antiquing" and "Trail Trek," a geocaching trail. The 88-page, full-color guide is available for pick-up at all North Carolina Highway Welcome Centers and the three FACVB Visitor Centers, which are located at 245 Person Street in Fayetteville, the Fayetteville Area Transportation & Local History Museum at 325 Franklin Street in Fayetteville and in the JC Penny Wing of Cross Creek Mall. 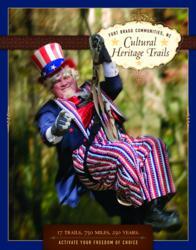 Follow this link to download a photo of the cover of the Cultural Heritage Trails Guide. Not able to stop by and pick up a guide? Each trail is also available for download at http://www.visitfayettevillenc.com/culturalheritagetrails/.